I’ve told myself from the age of 10 or so that I’d study abroad in college. Both my parents had done some sort of trip during their years in school, and I was determined to do the same. At the age of 20, I was faced with the reality of my dream, and it was exactly what I wanted. Everyone has the right fit for him or her; I wanted an internship in an English-speaking country over the summer. So in early June I was on a plane to London for the summer. Going abroad was full of adventure. The Killers at Wembley Stadium. Seeing actor Simon Pegg up close at his movie premiere. Casually flying to Dublin for the weekend. Stumbling upon the greatest hole-in-the-wall Thai restaurant. Cheering for Wimbledon matches with the locals at the bar. Attending a British musical. Going to a bar completely made of ice, down to the glasses. London was a dream. Of course I did real-world big-girl stuff like work, cook, clean, deal with roommates I’ve never met, navigate London and make plans for the weekends. Cooking and budgeting did lose its glamour within one day of being there, but the fun parts of London made up for it. But I was there to work and working I did. I was a News Analyst in a start-up technology business. Some of my work was interesting and pertained to my field, but as an intern I was expected to pitch in on all things even though I’m probably the furthest from a computer programmer (English/Comm Studies major representing). One day a week I attended British Culture and Politics class at the University of Westminster. I learned about the current state of England and it’s relationship with the European Union, Scotland and the Euro. My favorite part is where we took long (okay, maybe excessively long) three-hour walking tours of different parts of London. It was amazing to see how many facets make up London from the poorer West End to the wealthier East End of London. The best part was sharing the experiences with friends I met. I was the only person from Michigan, actually the entire Midwest, as everyone was from the East Coast. I found things in common with each one, and though they couldn’t quite understand some of my Michigan vernacular and I would be teased about my accent, it made my trip better to be surrounded by adventurous people. At the end of my trip my brother came over to London for a week, and then we met up with my parents in Scotland. After two months of being a grown up, it was nice to come back and be with my family (and hey, I wasn’t mad about them picking up the check). The last thing I want to impart on readers is to try and go abroad during college career. You are freer and have fewer worries. I learned a lot about London and even more about myself. College puts you in a bubble; biggest concerns include grades, parties and sporting games. Going abroad put me face to face with the real world and see what my future really holds. Check out my Pleiad colleagues’ summers. Travis did FURSCA, and homegirl Tess worked all summer. 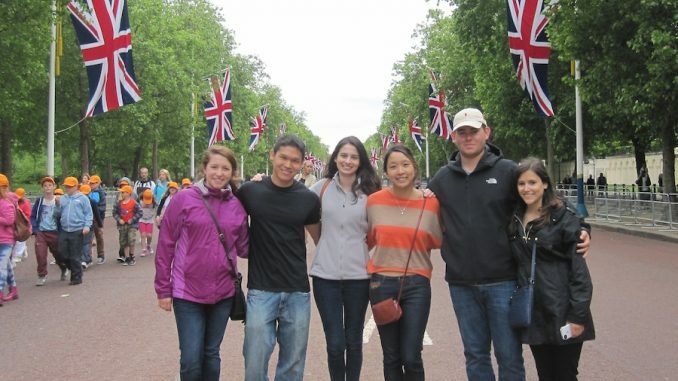 Claire, nice to hear that you had such great experiences in London! I definitely agree that college is a perfect time to travel. Would you be interested in sharing some of your travel experiences on Pink Pangea, the community for women travelers? If so, get in touch at rachel@pinkpangea.com.